Area restaurants, hotels and caterers have noticed a growing number of destination weddings taking place in the Spa City. There was a time when destination weddings were associated strictly with tropical locations. Eloping to a beachside locale was out, inviting loved ones along for the festivities was in, and a trend was born. Lisa Light, a destination-wedding planner and author of the book Destination Bride, says that what started as a custom reserved for the wealthy blossomed into a mainstream tradition 20 years ago, with vacation hotspots such as Las Vegas, Miami and Newport elbowing for market share. In recent years, however, area restaurants, hotels, caterers and the like have noticed a growing number of destination weddings taking place in Saratoga Springs. 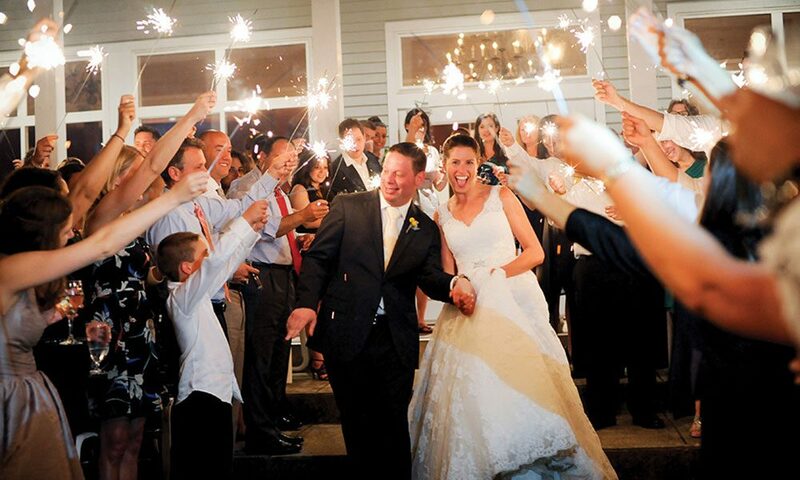 Though she plans weddings around the globe, Light said the Hudson Valley recently became the number one destination wedding location in the United States, and Saratoga Springs has grown exponentially more popular in the past decade. Area wedding experts agree that the Spa City’s make-up is a compelling formula: whirlwind weekends that start with a rehearsal dinner at a downtown restaurant, ceremony and reception at an elegant venue such as the Canfield Casino or Hall of Springs, and a Sunday brunch at the Gideon Putnam. In between there’s fun to be had: museum stops, rounds of golf in the State Park, hikes in the Adirondacks, spa treatments, or shopping up a storm along Broadway. So solid is the trend for Saratoga-based destination weddings, the Saratoga Convention and Tourism Bureau recently created the position of Destination Wedding and Social Market Specialist, appointing industry veteran Tom Ellis in May. “A lot of people tell us they want a place people can get to in a day,” says Ellis, who spent more than two decades doing event planning in New York and Los Angeles. “Flying has become much more expensive and problematic. It’s a big reason why upstate New York has become a destination in general.” He adds that most clients are from nearby metropolitan areas such as New York, New Jersey and Boston, but inquiries come from as far as California. With spring and summer weddings booked at full throttle, the experts agree that reserving in the off-season or on a weekday is a great idea, particularly if you want to plan the event within the span of a year or less. For better or for worse, experts say there’s no clear-cut rule as to who pays for destination-incurred expenses such as transportation and hotels, which makes Saratoga an attractive option for many. “There are people with the means to cover the travel expenses of their guests, but most don’t,” says Ellis. Many caterers and hotels offer price breaks for weddings booked off-season or on a weekday. “We usually offer about a 15 percent discount for weddings booked off-peak and a 20 percent discount for weddings booked mid-week,” says Baker. Ellis said his aim is to make constructing a destination wedding less overwhelming for a couple. “I’m the first point of contact. I don’t provide wedding planning but help in the first steps of it,” he says. “I’ll take couples to site visits and introduce them to the parties involved.” He notes that saratoganyweddings.com and discoversaratoga.org have comprehensive lists of venues, caterers, photographers, florists, disc jockeys, bands, make-up artists, and other vendors involved in the production and design of weddings. Saratoga Convention and Tourism Bureau President Todd Garofano said that based on feedback he has received from members in recent years, the destination market in Saratoga is lucrative and growing.